A city , modern city during Rome era, Alexandria, where all cultures were living together including Peganism until last Roman emperor made Christianity as state religion and here comes destruction of other cultures. Pagans, Christians and Jews had coexisted in polytheistic peace in early Ptolemaic Alexandria, until, as often in history, religion raised its ugly head in the fourth century after Emperor Constantine in Rome decided to make Christianity the official one-and-only religion of the empire. After centuries of religious pluralism in Alexandria, “Christians” rose up against the pagan worshipers of Mithras and the Roman deity, Jupiter and the Egyptian deities of Osiris and Apis, killing, spreading mayhem and destroying their places of worship. The pagans responded in kind until they were subdued. Then the Christians turned on the Jews, attacking private homes and shops in a kind of Kristallnacht and demanding their expulsion from the city. 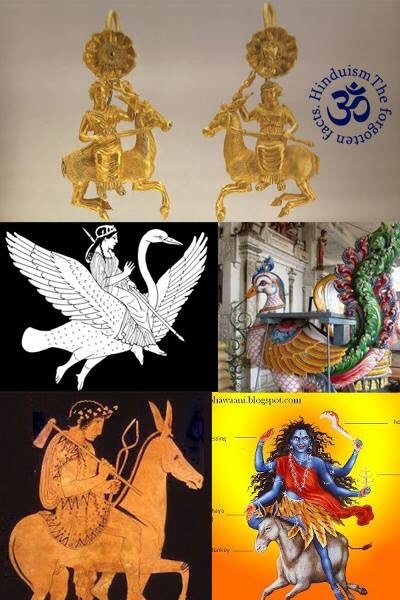 Hindu Vahanas (Mounts of Gods) are found in different parts of the world. We have already seen them in Afghanistan, Iraq, Syria, Iran, Egypt, Turkey and other places. Since the Middle Eastern countries were under the Kassites, Hittites and Mitanni from 1800 BC, who followed Vedic Religions, we see the Vahanas of gods there in sculptures and inscriptions. I have given the proofs in my earlier articles. Now I furnish more details about how the European countries adapted Hindu Gods’ vahanas with new stories. We have sculptures showing Hindu Vahanas in Rome (Italy) and various parts of Greece or in the countries where Romans and Greeks extended their rule. Most of these sculptures were from First few centuries before Christ.